lollipops | Healthy Product Reviews!! Yea-I’m feeling candy this week. It’s DEFINETELY one of those weeks where I need some sweets! The lollipops come in several varieties- SuperSOUR Pops, Strawberry Pops, Fruit Pops, Fiesta Pops, and Vitamin C Pops. I got to try the SuperSOUR Pops and the Vitamin C Pops. Each pop is only 22 calories, and is round/flat in shape. They are about the size of a quarter or half dollar each. 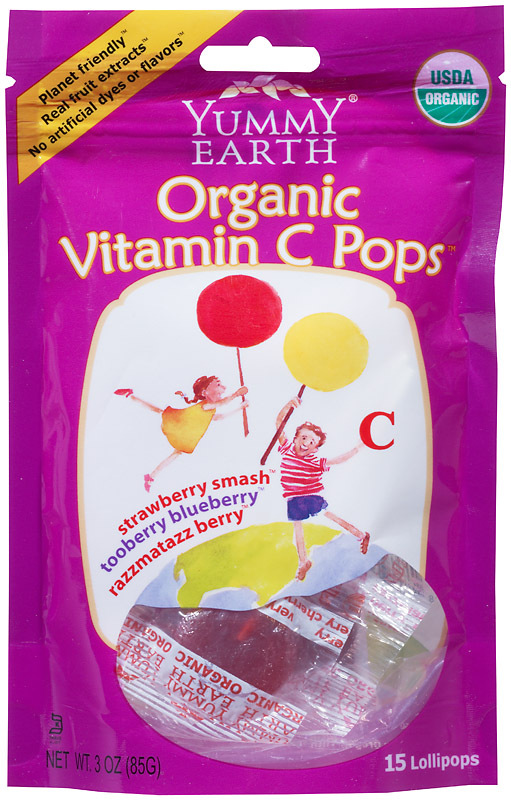 Starting with the Vitamin C Pops- each bag has 3 flavors, strawberry smash, tooberry blueberry, and razzmatazz berry. 1 pop provides you with 25% of your daily needs of vitamin C.
tooberry blueberry- ooh I like this one the best of the 3. It’s sweet with a nice blueberry taste- real blueberry, not “fake” blueberry. It also has hints of grape flavors, and isn’t too tart. It doesn’t leave that “stinging” feeling sometimes lollipops give you on your tongue. razzmatazz berry- this one has a mixed berry/fruit punch flavor. It is smooth and sweet, with stronger strawberry/raspberry fruit essences. The SuperSOUR pops has 4 flavors- strawberry smash, sour apple tart, googly grape, and very very cherry. I was hesistant to try these- I’m so not a sour girl. In fact, I used to run my sour WARheads candy under the water when I was younger until all the “sourness” went away and it was all sweet afterwards. But, they, in fact, weren’t really sour at all- they just had a bit more of a kick than the original flavors. strawberry smash- similar in taste to the Vitamin C variety- but with a bit more tang. sour apple tart- I liked this one! It has a granny smith apple flavor to it, and it was the most sour of all 4 of the flavors. The tangyness really stayed the whole time eating the lollipop, and didn’t fade. googly grape- this one is tied for my favorite with the sour apple tart. Normally I HATE grape flavored things (they usually taste like cough medicine…yuck..), but this baby reminded me of my favorite grape Tootsie Pops I used to eat when I was younger. Not tart at all- but a sweet, delicious, grape. Overall, I’m giving these 4 stars. It’s a much healthier (and more eco-friendly!) alternative to commercial lollipops, and they have no refined sugar. That’s a big plus for me- if I want candy, I like to feel at least a little less guilty knowing there is no refined sugars. They are perfect when I’m in the mood to nosh, but don’t want to blow a big calorie bang, and hit your sweet tooth quite nicely. I just hope that they evenly distribute the flavors better in the future– I didn’t get to try the very very cherry flavor, and only got one googly grape (figures it would be my favorite! 😡 ) in my bag. 3 pops are 70 calories, 0 grams of fat, 17 carbohydrates, and 0 grams of protein. Each pop is about 22 calories each. Organic Evaporated Cane Juice, Organic Tapioca Syrup, and or OrganicRice Syrup, Citric Acid (from beet sugar), Natural Flavors, [may contain] Organic Black Carrots, Organic Apple, Organic Wheat Grass, Organic Black Currant, Organic Carrot, Organic Pumpkin. So lately I’ve been craving lollipops. I see my friends chomping on Tootsie pops and Jolly ranchers etc. and i was very tempted to give in- but not after looking at the ingredients in those things. YUCK! So i went to vitaminshoppe and saw these babies. YUMMYEARTH Organic lollipops-sweetened with fruit juice too! I got the 4 pack with mango tango, pomegranate pucker, tooberry blueberry, and wet-face watermelon. Mango Tango- this one i think is my favorite of the bunch. flavor is mild but sweet. Pomegranate Pucker- they weren’t kidding with the pucker! i had to work my way into this one- very tangy! Tooberry Blueberry- i didn’t taste much blueberry, but i still liked this one. it was the sweetest of the bunch. Wet-face Watermelon- this had the most mild flavor, but still sweet. Overall i think these are worth it when you need a little pick me up or something sweet after lunch. they are 22 calories each, decently sized, and have “planet friendly ingredients”. Organic Evaporated Cane Juice, Organic Tapioca Syrup and/or Organic Rice Syrup, Citric Acid (from beet sugar), Natural Flavors, Organic Black Carrots, Organic Black Currant, Organic Apple, Organic Carrot, Organic Pumpkin.